As days of January are passing the date of 14 January is coming closer on which Chairman of Minhaj Ul Quran Dr Tahir Ul Qadri announced to do Long March towards Islamabad and announced to make world's biggest Tahrir Square in the capital of Pakistan. Experts are still debating that what is actual purpose of Dr Tahir Ul Qadri and who is actually behind him? some says US/UK are backing him. other claims Army is supporting him and his main purpose is bring another Martial law in Pakistan. Only time will tell that what was real purpose of Tahir Ul Qadri? it will also be interesting to see that how much people Dr Qadri will be able to gather for long march and will they be able to reach in middle of Islamabad? It will also be watchable that how much MQM contributes in this long march and will they be able to stay as a Government ally after this long march? Government may try to negotiate with Dr Qadri and MQM to stop this long march. Who Will Win The Elections 2013 In Pakistan? 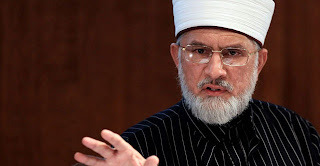 Who Is Behind Tahir Ul Qadri Movement?